The Rantapuisto Oy is situated near the sea in Helsinki’s eastern Vuosaari district. This natural setting is surrounded by parklands and has many different jogging trails close at hand. Not only is the hotel an ideal place for nature lovers, but it’s also only 3 kilometers from Itakeskus, the largest shopping mall in the Nordic countries. Helsinki Vantaa Airport is approximately 20 kilometers from the Rantapuisto Helsinki. Travelers looking to venture further out can catch a ride at the Rastila metro station, which is 1.5 kilometers away. All of the Rantapuisto Hotelli’s guestrooms were recently refurbished and include hardwood floors and modern facilities such as a hairdryer, satellite TV, direct-dial telephone, and Internet access. 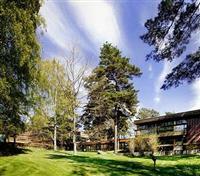 This modern two-story hotel is surrounded by towering fern trees and overlooks the archipelago. Inside, guests can check in at the 24-hour front desk, which is operated by a multilingual staff that can also lock away valuables in the hotel’s safe deposit box. After checking in, visitors can head to one of the three on-site restaurants, which offer an array of delicious meals and refreshing drinks. Guests traveling for their employer can make use of the Rantapuisto Hotel Helsinki’s conference facilities during their stay.